When it comes to home decor, it is all about getting unique and manageable ideas. Once you have the ideas, you can put your stamp on a space, make it your own, and create your desired atmosphere. 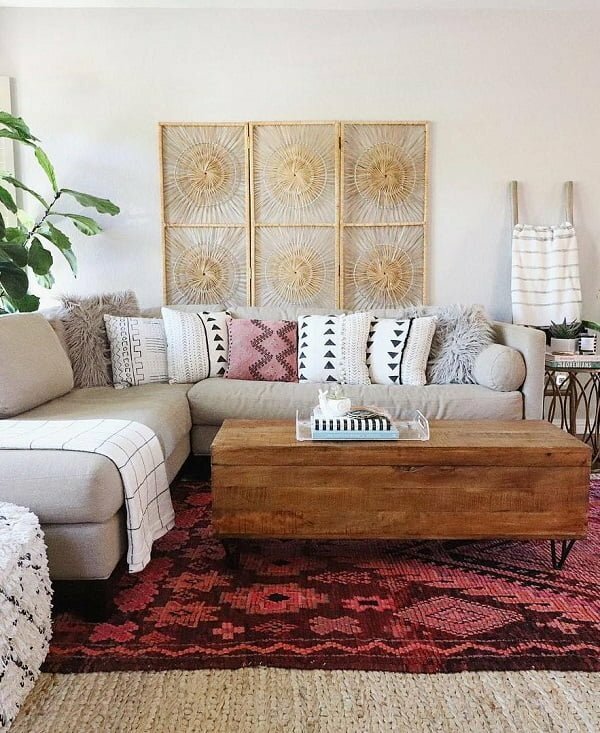 Home decor is not just about choosing a style, but also about knowing how to make an area flow with the rest of the home. 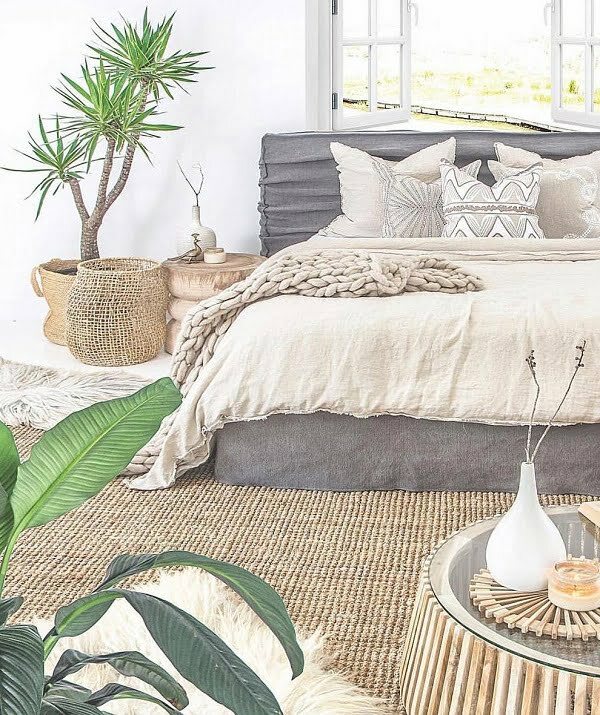 The rustic coastal look is a fabulous style when it comes to adding warmth and character to a space. It also has many key elements that make perfect projects for DIYers, making it ideal for working within a budget. 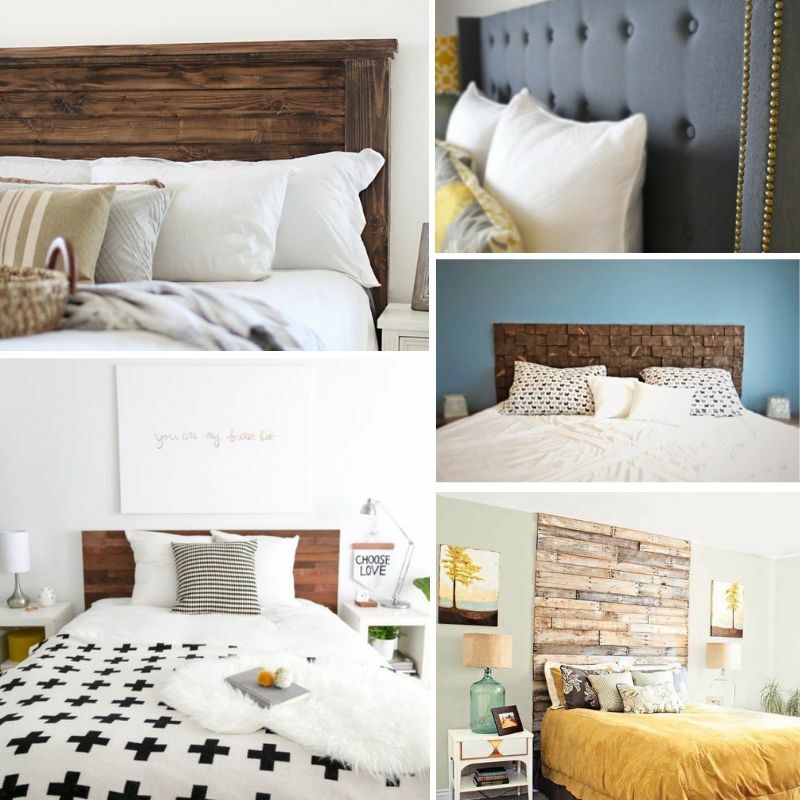 From chunky wood tables, to the look of weathered furniture, to wood plank headboards, adding a rustic coastal flare can be as simple as employing a few of the home decor ideas listed below. 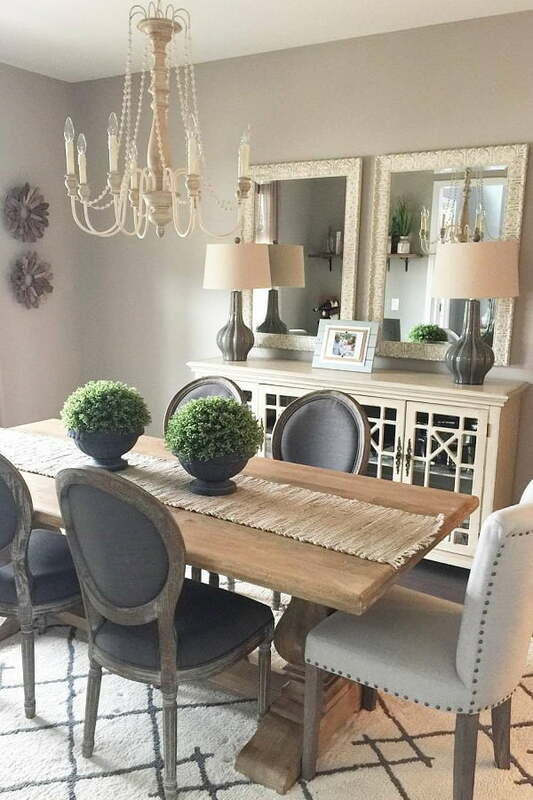 Pairing the rustic with the modern adds visual interest and flair to a dining room. 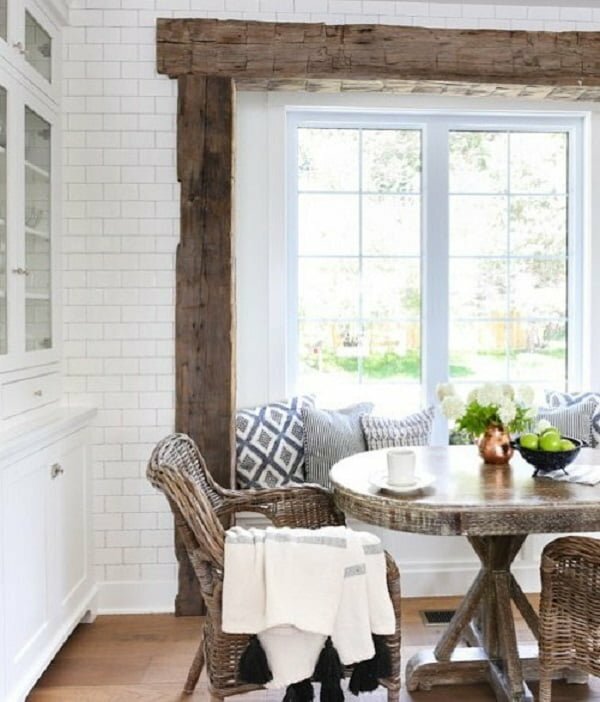 A great way of accomplishing this is by pairing a chunky wooden rustic-looking table with modern or traditional-looking chairs. 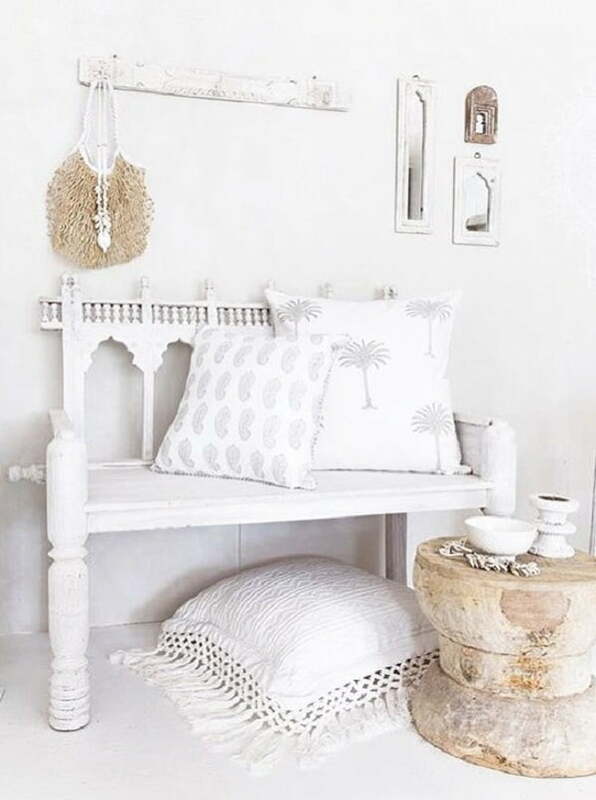 The coastal look is easily achieved with the look of crisp white, accompanied by a piece of weathered furniture. 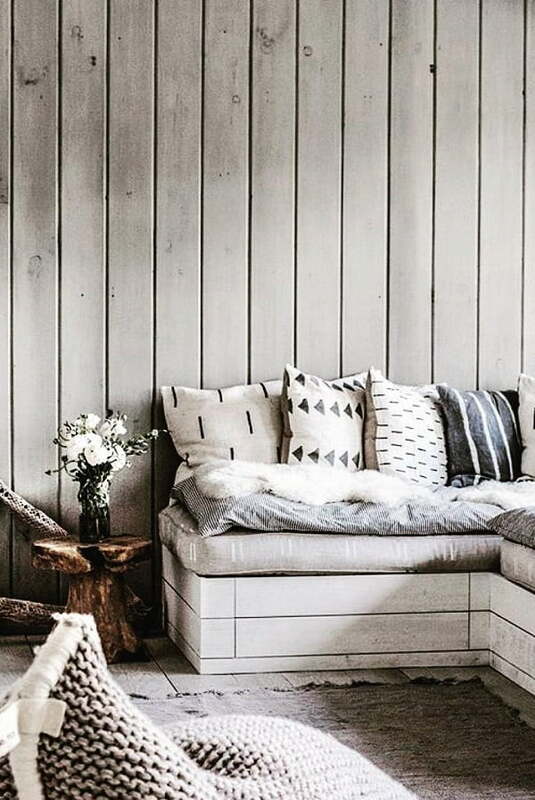 A crisp white sofa and a rustic weathered coffee table is a perfect pairing. 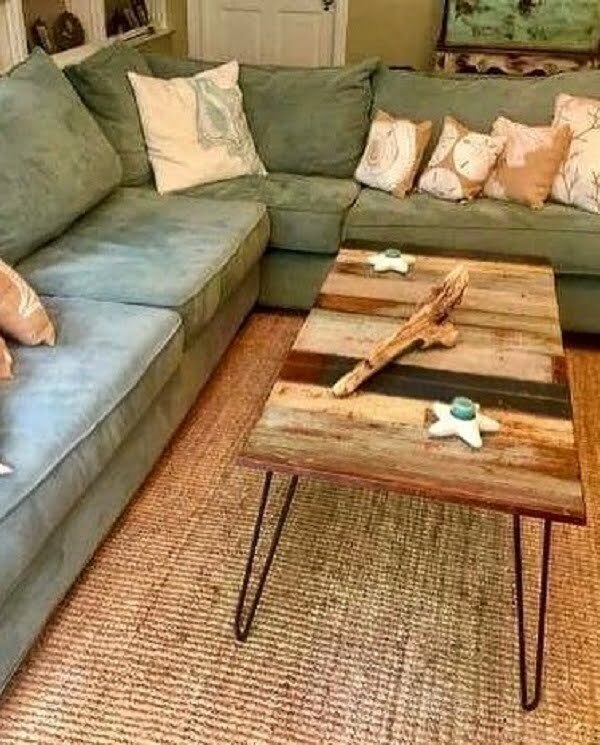 Few things say ‘rustic’ and ‘coastal’ more than adding a wood plank element. Headboards are ideal for this project and can be accomplished by simply attaching wood planks to the wall space behind the bed. 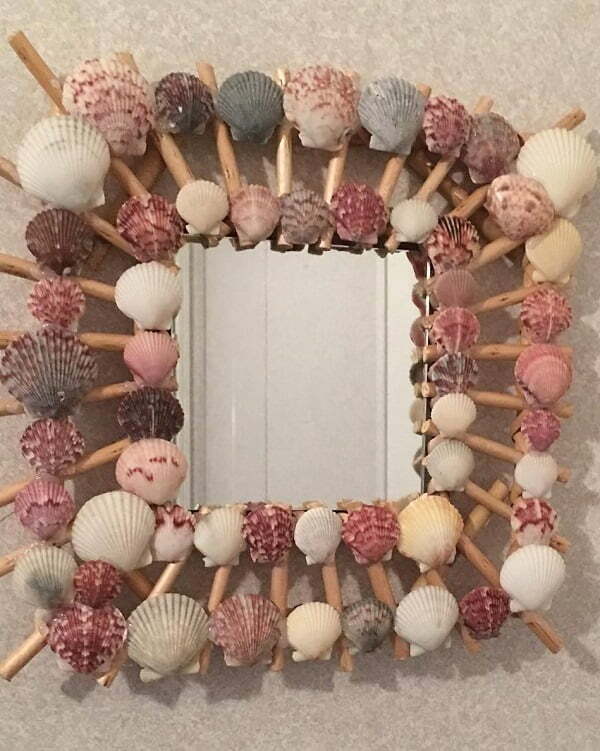 For the coastal look, simply adding a natural coastal element, like sea shells, to a small mirror or frame can make a big splash. The great thing about rustic coastal decor is that it can be achieved so simply. 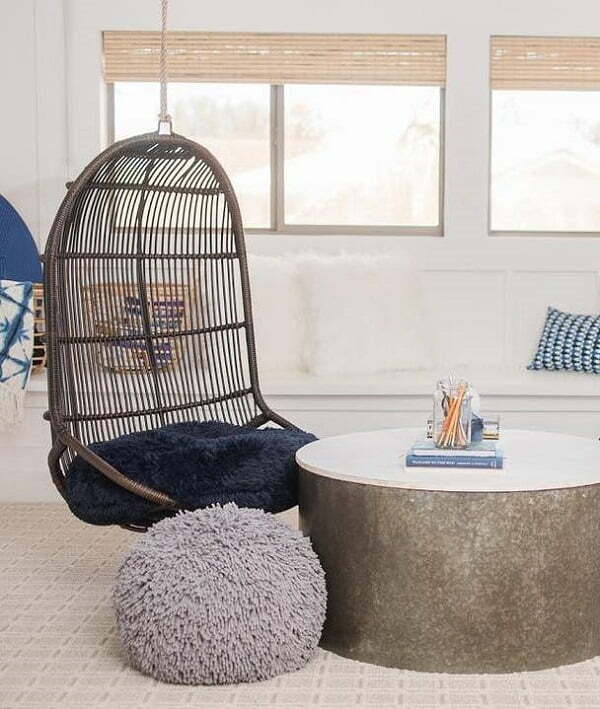 Adding some rustic boat rope to a lamp base can add just the right touch to your space. 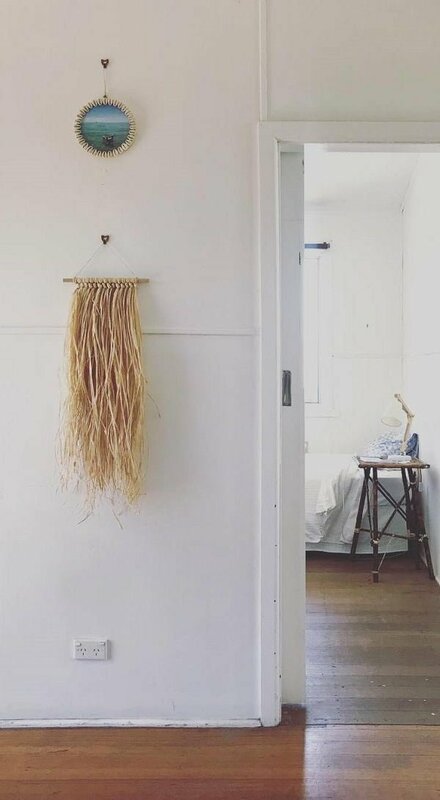 For a pop of rustic character, a wall hanging made from simple elements such as a stick and some earth-tone twine can really stand out against a white wall. Gallery walls are hugely popular when it comes to adding visual interest. 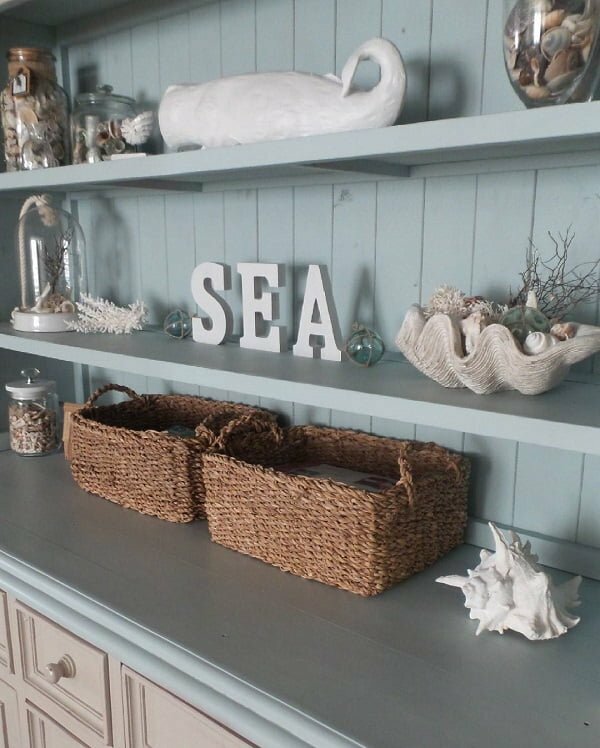 For the rustic coastal look, group pictures of seascape scenes with natural basket items. 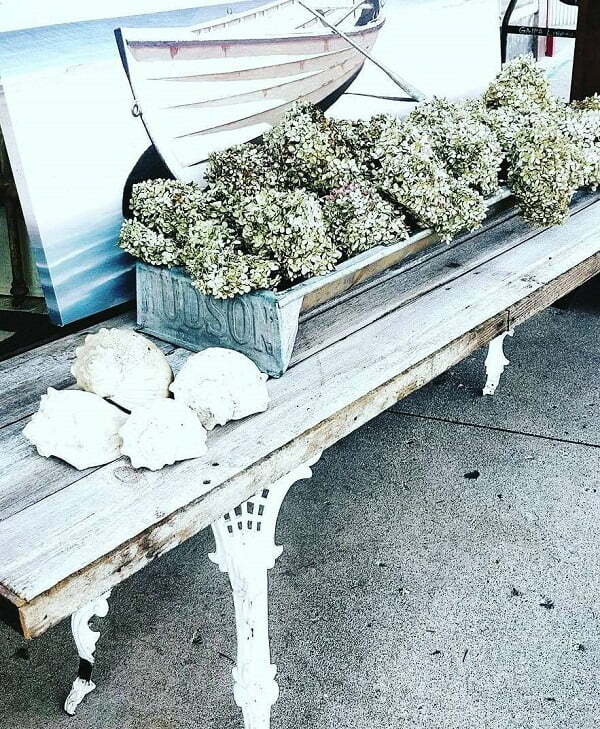 A coastal vibe is perfected by looking to nature for inspiration. Adding a sand-colored sisal rug brings touches of the outdoors in. Never underestimate the power of the mighty throw pillow. Adding a layer on a sofa lends a space the cosy and comfortable feel of coastal living. 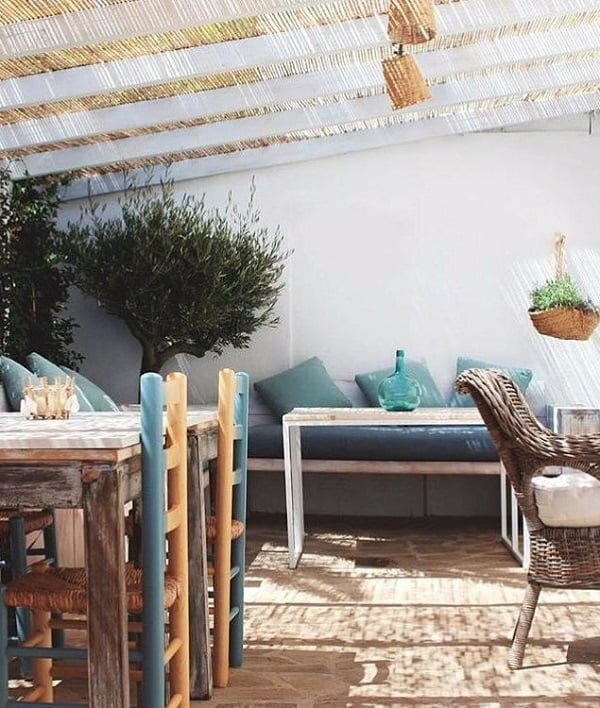 Adding hanging rattan beach chairs instantly adds coastal touches of comfort to a space, while adding funky and functional seating. Adding an architectural element like shiplap walls transforms a space before even adding furniture. 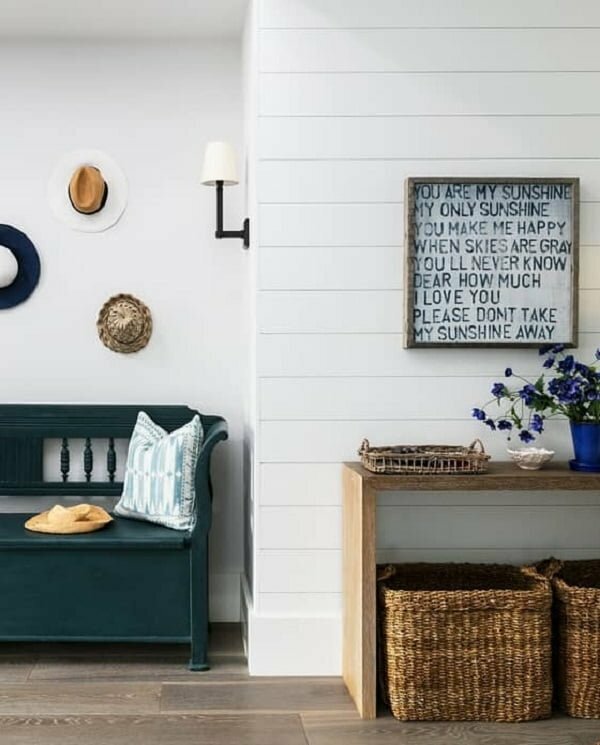 Few things scream rustic coastal decor like white shiplap walls. For a huge rustic splash, look to the barn door for inspiration. 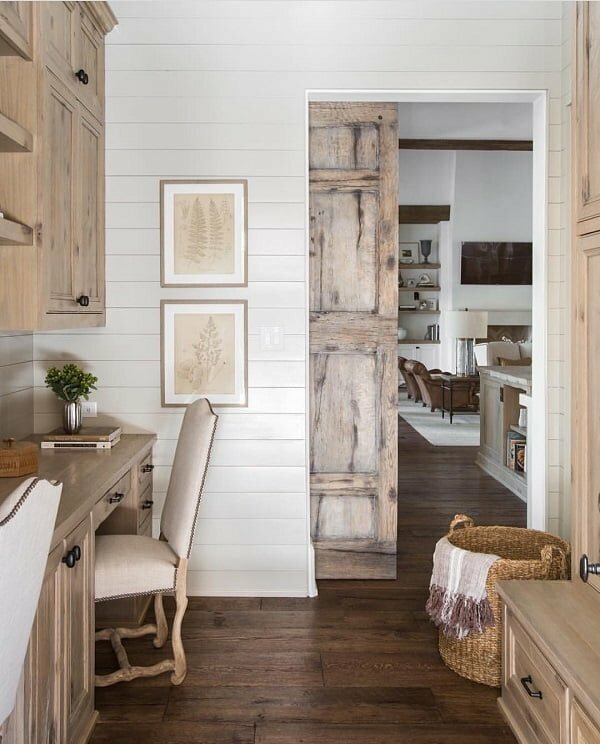 Adding a sliding barn door adds function as it can separate a space, while enhancing the rustic feel. Adding vertical wood plank walls lends a space the rustic coastal feel like little else. Coupling it with hardwood floors takes it to another level of rustic charm. 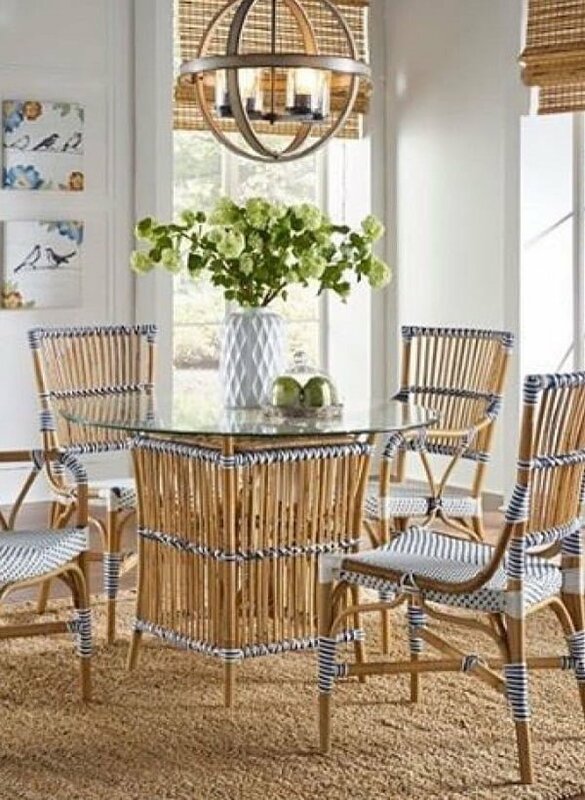 Rattan furniture is no longer just for the outdoors, and when it comes to bringing outdoor elements inside, rattan furniture accomplishes that flawlessly. Adding a wood beam to frame out a window is visually stunning, and when juxtaposed against crisp white walls, the contrast is rustic and warm to the core. 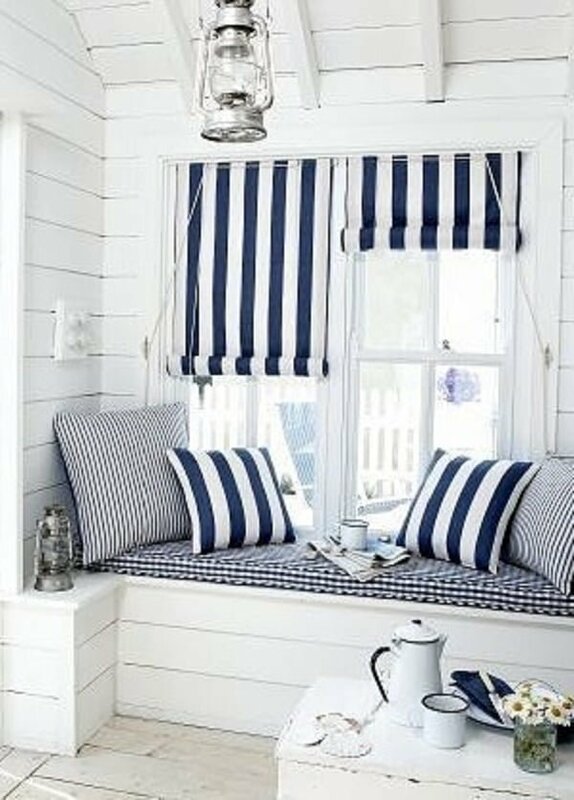 Mixing various shades of white invokes the feel of Nantucket coastal homes and is a warm, clean, and neutral look adaptable to any season. 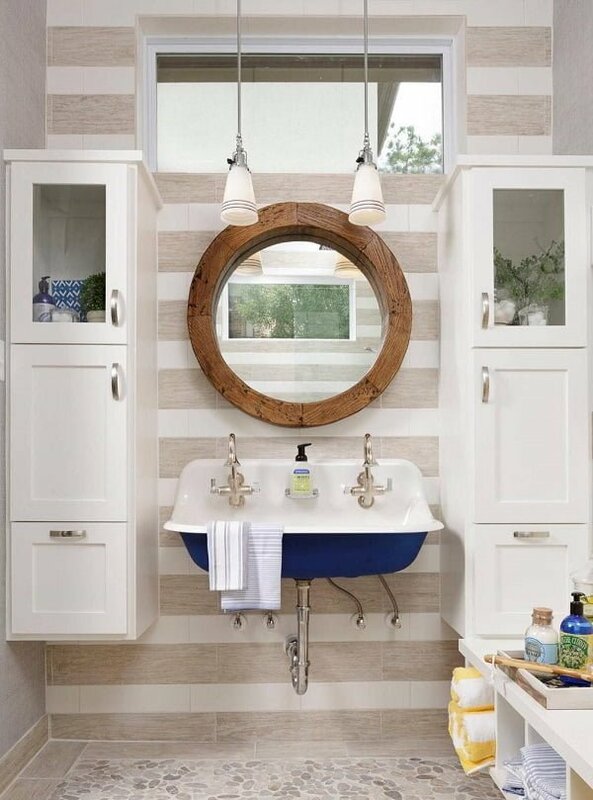 Bathrooms are generally small spaces, but adding a farmhouse-style sink to a rustic bathroom can make a large impact when it comes to rustic coastal decor. The look of a beach hut is easily executed by adding a basket-screen ceiling. 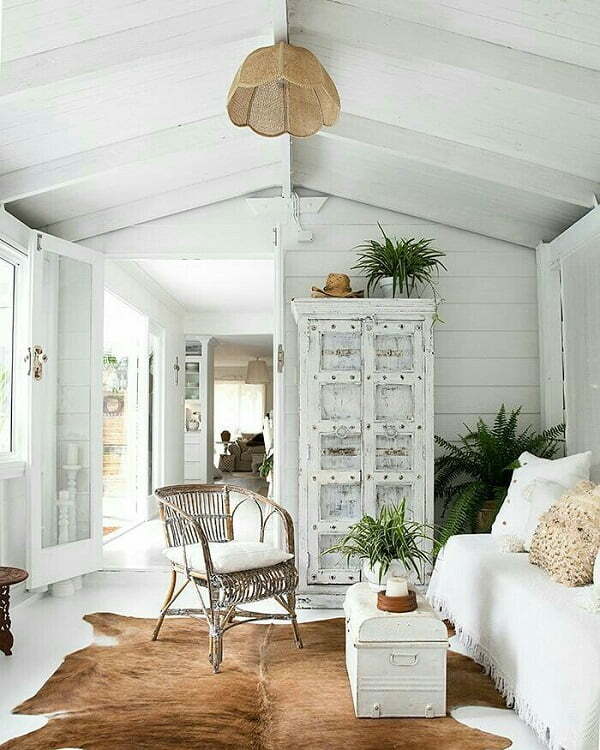 The beach hut vibe is the ultimate in coastal relaxation. 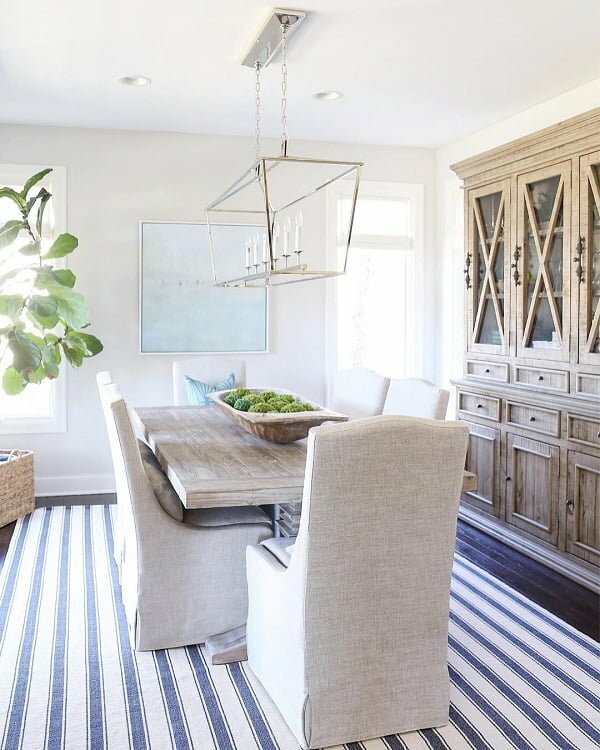 Adding an element of nautical stripes to a space, such as in a rug, packs such a visual punch it can carry the coastal look all on its own, even when paired with modern furniture. Having a large-scale piece such as a fur rug helps anchor the eye, while adding a rustic textural splash to the space. 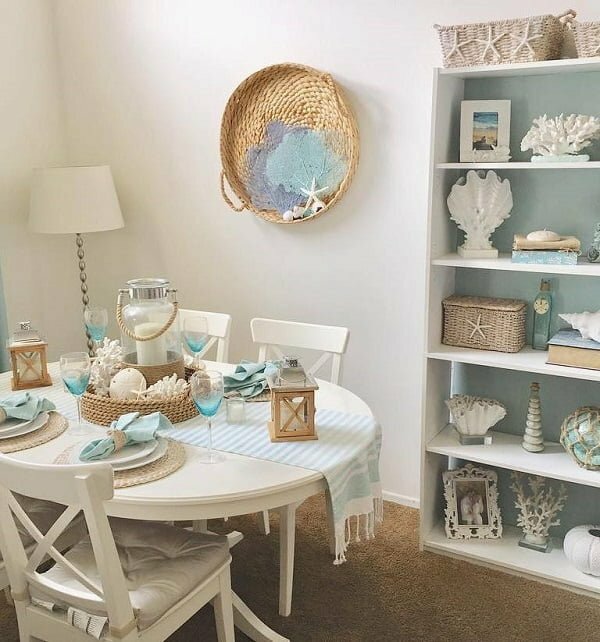 Having open shelving in a space is great for decor as simply placing some themed items, such as nautical ones, create a lovely focal point and can easily be switched out for a new seasonal look. 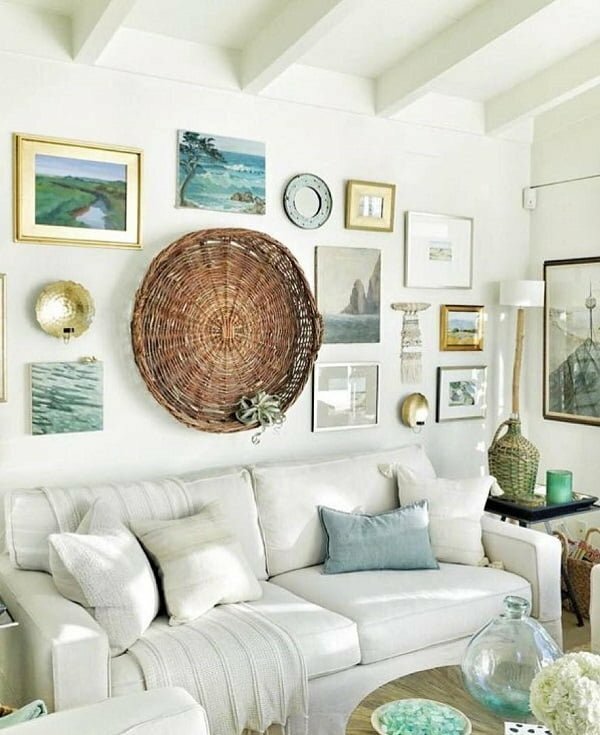 For a rustic coastal look, use artwork to cement the feel. 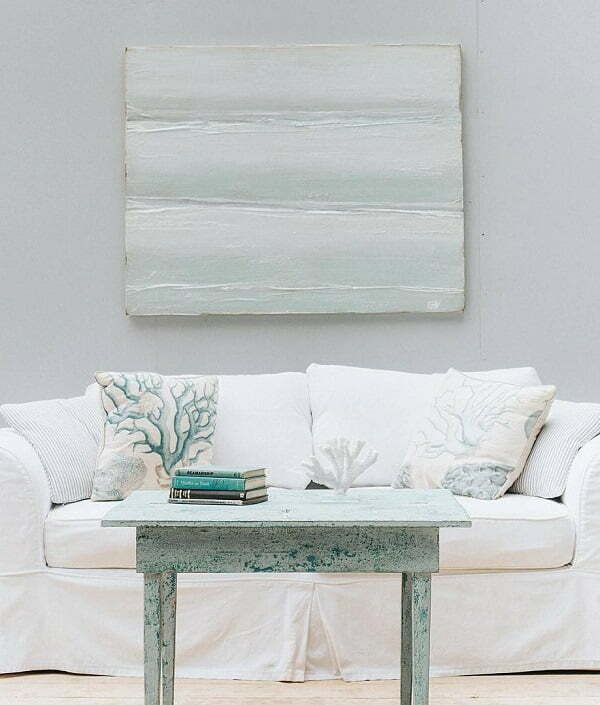 A simple seascape or nautical painting can be all it takes to transform a space from drab to fab. Choosing the appropriate color palette is key when seeking a certain look. 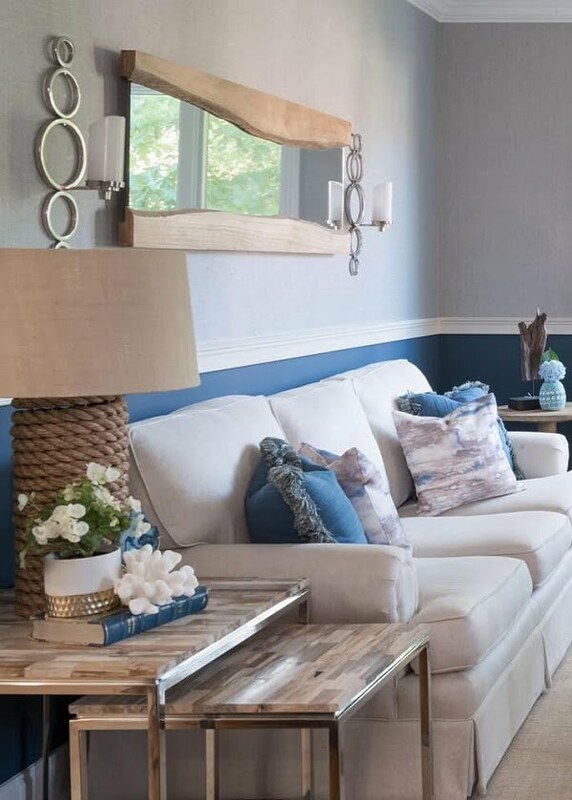 Using light neutral earthy tones like whites and blues bring the coast to mind and into the home. Adding a piece of furniture with various worn wood stains and textures is the ideal way to add some rustic charm and character to a space. Gone are the days when only pictures and mirrors commonly adorned walls. For a unique one-of-a-kind accent wall, display a themed collection. Something as simple as hats can enhance a space by creating a feature wall.